As your company explores the need for life science labeling solutions, consider that Innovatum has its time tested offerings available in a cost-effective package as a hosted labeling solution. Our industry leading products and services are now accessible from the cloud to those seeking a robust, modern, and scalable solution. With accessibility, safety, and functionality directing our development process, our team has made available all the power and convenience of ROBAR from a hosted environment, minimizing ongoing IT involvement. ROBAR Online gives companies the option to make labeling an operational expense rather than a capital one. Innovatum has spent extensive time making ROBAR’s home in the cloud viable using a scalable security model that is configured to your needs. With ROBAR Online, the offerings that have made ROBAR such a success are now hosted and accessible to more companies looking for the world’s best life sciences labeling systems. For those companies that decide labeling related capital expenditures are not for them, our new hosted labeling solutions are a welcome alternative. ROBAR Online eliminates the need to purchase, manage, and maintain server hardware, thereby freeing up valuable IT resources. Savings may be realized in technical departments for companies looking to alleviate these costs. This release of pressure allows our offerings to reach a wider array of smaller scale companies. The process of maintaining FDA GUDID submissions through Excel may also be retired, streamlining the process in a way that Is affordable, accessible, and sustainable. With security and data assurance at the forefront of our design process, your company can feel at ease benefiting from the savings that come from utilizing a hosted solution. We have taken cloud based security concerns and turned them on their heads by making ROBAR a hosted labeling solution. Innovatum is hosting in a single tenant architecture, which ensures that your company’s data, and only your company’s data, resides on a single server. It cannot be commingled with the data of other companies, unlike in multi-tenancy. Benefit from the practiced use of Next Generation firewalls, digital certificates, and multi-factor authentication. Carefully applied security measures enable the unfettered use of ROBAR Online’s extensive functionality. 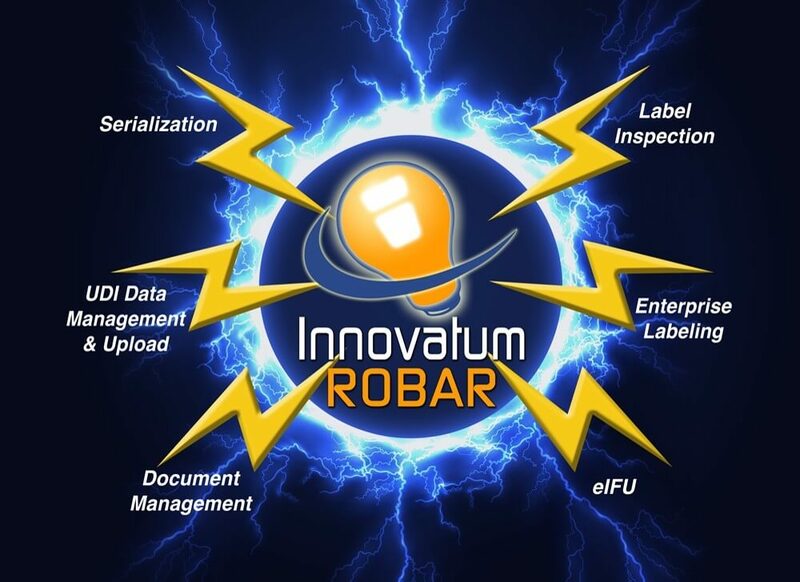 ROBAR Labeling, ROBAR Master Data Management and Communication Manager, and ROBAR Docs all function as they do on-premise, only now they are accessible via our hosted labeling solution. You can also count on the use of integrated connectivity to ERP systems, MES and PLM as well as the ability for third party labelers and contract manufacturers to print off of your server without having to install software. For 15 years Innovatum has managed its ROBAR on-premise solution for many of its customers, honing skills for delivering a hosted solution regardless of its physical location. Innovatum now offers a world-class, cloud based solution to industry leaders, but also to smaller companies who lack a dedicated IT department. To start the conversation on how to improve these areas of your business and save on hardware, IT expense, and validation costs while still enjoying the best regulated labeling technologies and services available in the industry, contact Innovatum today at 877-277-3016.